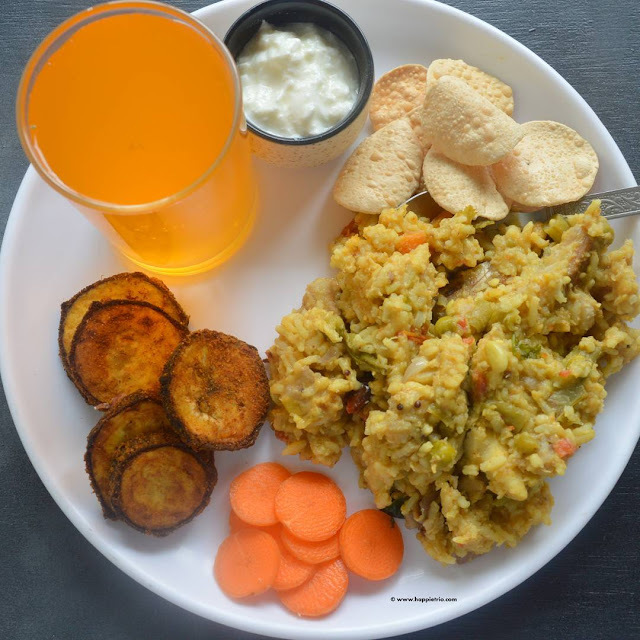 Kootanchoru Recipe | Rice with lentils and Mixed Vegetables with step by step photos .Kootanchoru is a famous rice variety in the districts of Tirunelveli ,Tutocorin and Kanyakumari of TamilNadu State. It is a one pot meal and easy to whip up in just half an hour. It just involves cooking the soaked rice and dal along with vegetables and then finally seasoned with coconut oil. Last year I have shared this recipe of Kootanchoru in my Instagram handle, however I have not blogged this recipe at that time and I got so many requests at that time to post the recipe and finally it took me almost a year to do a blog post on that. Another year we are back with another Blogging Mega Marathon. Last Year April Month we did A-Z Baking across the world. This month fully I will be sharing recipes for 26 days with a sub theme each week .So this week fully I will be sharing some delicious lunch box recipes. Kootanchoru is an easy one pot meal and hence it can be prepared easily and packed for lunch box in just half an hour. So now let’s see how to prepare this delicious kootanchoru. 1. Chop the vegetables and soak in water till we use. Soak the Toor Dal and Rice in water for 30 mins. 2. Soak Tamarind in Water to extract the juice. In a blender add coconut, Green Chilli and Cumin seeds along with little water and grind it to a puree. 3. Drain the excess water and add the Soaked Toor Dal and Rice in a pressure cooker. Add the chopped Vegetables, Tomato. 4. Blended Coconut puree, Water and Tamarind Water. 5. Next add Chilli powder, Turmeric powder and the required Salt and Pressure cook for 4 whistles and in a low flame for 10 mins and switch off the flame. 6. Wait till the pressure is released by its own and open the cooker. In a pan add oil once it heats up add Mustard Seeds ,Fenugreek Seeds,Hing,Curry Leaves and Dry Red Chilli prepare the seasoning . 7. Pour it to the cooked Rice. Mix well and serve. · The Rice will thicken as it cools down. · You can also add green peas. · Pairs well with just chips or any fryms. · It stays good for a long time. This is how I served my kootanchoru and I have shared the same in my Instagram some days back. Enjoy this easy and delicious kootanchoru along with fryms. A superb healthy one pot meal to kick off the marathon. It sounds like a cousin to the classic BBB. That is a healthya and tasty one pot meal to pack in the lunchboxes. It has all the protein and carbs. Lovely start to the marathon. That is such a hearty and delicious looking dish Sharmila. Love that it has so many veggies and that spice paste must add lots of flavor to the dish. I have always loved one pot meals , they make perfect lunch / dinner meals . I am bookmarking this traditional meal to try soon though I will minus the brinjals . Absolutely delicious comfort meal ! Interesting theme to work on . One pot meals are my favorite, be it any time of the week. This looks so much similar to the hotel style Sambhar saadham. I love how you have served it. Can't wait to see what you have cooking for all the themes. Looking forward to all your posts Sharmila. When it comes to lunch box recipes I prefer to make them one pot. This choru is an amazing treat and a nice way to sneak in veggies for kids. Wholesome one pot meals like these are life savers. Love those cute vegetable garnishes. Looking forward to your other dishes in this marathon. Such a delicious and healthy one pot meal. This one is very apt when we need to pack for the lunchbox or have surprise guests for lunch! Wow that's simply awesome Sharmila, the plate looks wonderful and so inviting..This dish surely makes a wonderful one pot meal to pack for lunch..Can't wait to read your month long posts! My kind of food, i can survive for many days with this healthy, protein rich one pot meal. What a fabulous dish sis, lovely dish. My favorite one pot meal and still we liked to pack this for our one day trip !!! Healthy and delicious meal. Great post to start this Mega BM!!! That looks tempting! one-pot meals are such life-savers!! This looks pretty close to our BBB,except for the masala added!!! Healthy and delicious one pot meal! Needless to say, I love your kootanchoru recipe. It's my fav. I thought you posted this on the blog... anyways a great way to start the mega BM.. Love this traditional and authentic recipe. packed with goodness and so easy to make too ! look forwward to ur BM this month ..
What a healthy and filling dish Sharmila, so different from the normal khichdi I make at home. Adding raw banana, drumstick, brinjal makes it different. Bookmarking your recipe.